Excerpt, with modifications, from Dr. Abatzoglou’s article (read the entire article on the Climate CIRCulator website). Does this recent cold snap have anything to do with climate change? Before we point any fingers, let’s break this question down into bite-size pieces. Figure 1. 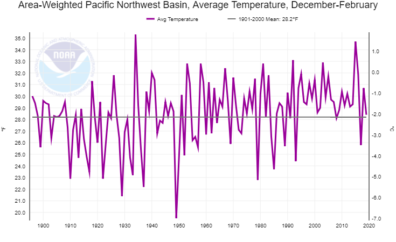 Time series of Dec-Feb average temperatures over the Pacific Northwest during 1895-2019. Data source: NCEI Climate at a Glance (https://bit.ly/2G7C3mC). Winter temperatures in the Northwest are variable. This is quite apparent in Figure 1. This is due to the strong jet stream and mid-latitude waves in winter. Some climate researchers now suspect that cold air outbreaks in the mid-latitudes will paradoxically increase with a warming planet. This increase in cold due to warming is itself due to a weakening of the jet stream as the Arctic warms much faster than the lower latitudes in winter. A weakened polar jet stream, it has been argued, allows for more “loopy” atmospheric patterns that could displace cold arctic air masses from the north to the south. This is precisely what we saw in February and what parts of Western Europe and the eastern US have been privy to in recent winters. However, we should note that the research is still being evaluated and is not something that climate models agree upon. Sure it was cold in the Northwest and other portions of the US and Canada, and it was bitterly cold in the American West in February, but globally not so much. Much of the United Kingdom basked in exceptionally warm temperatures in February, while Australia had its warmest December to February on record—besting the previous warmest summer by a whopping 1.5°F. So the globe as a whole certainly was not experiencing the same level as cold as we were this winter (Figure 2). Figure 2. December 2018-February 2019 temperature departures (degrees C) from 1981-2010 averages. 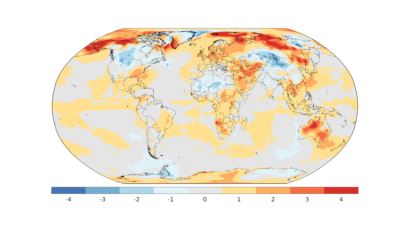 Data source: ERA-Interim from Copernicus Climate Services (https://climate.copernicus.eu/). What is clear is that our planet’s northern climes are seeing a marked reduction in the extent of extremely cold air masses in winter. Because the Arctic is the origin, or source region, of the cold air outbreaks that we experience in the Northwest, the disproportional rate of winter warming in the Arctic and high-latitude landmasses across Canada over the past century means that our cold air outbreaks should be warmer than they used to be. Indeed, the coldest daily temperatures of the year have warmed far-greater than average winter temperatures across the region. 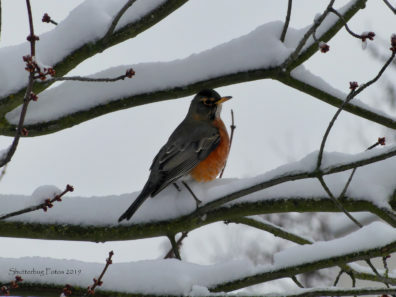 While there has been less research done on changes in observed or future snowfall extremes relative to temperature, there is reason to believe that changes in snowfall extremes could be more nuanced. On the one hand, warming leads to higher snow levels and less precipitation falling as snow. On the other hand, precipitation intensity is modeled to increase in general terms. This means that snowfall extremes may increase in areas that are sufficiently cold today and that will remain cold enough (and be above the future rising snow line) to capitalize on increased precipitation rates. For instance, one study found that extreme snowfall events are likely to increase in magnitude relative to other snowfall events by the mid 21st century across the western US mountains. Another study found that daily temperatures warm the least during heavy precipitation events under future climate scenarios. So, while climate change did not cause the frigid late winter temperatures this year, climate change likely made this winter less cold than it would have been. That may be of little consolation given the weeks of teeth chattering in February and early March. But in the long run, this might lead the region to welcome instead of fear the occasional snowpocalypse. This excerpt is modified from a post that is part of Northwest Climate Currents, an ongoing Climate CIRCulator series that uses the Northwest Climate Toolbox and the data it collects to help Northwest residents understand and prepare for the region’s climate events. The Toolbox is a suite of free online applications designed by CIRC researchers and intended to help foresters, farmers, and water managers respond to and prepare for climate variability and change and related impacts.